Boun Lod’s most recent surgery was late last November, when the surgeons worked on her neck, mouth, and eye. Originally, the doctors said they’d like Boun Lod to stay near the hospital until March so they could monitor the healing process. But, when the doctors examined Boun Lod in January and saw how well she was doing, they gave her the go-ahead to return home to Laos. With Air Canada and Aeroplan’s very generous donation of tickets through the Kid’s Horizons Programme, we were able to get Boun Lod and Noi home on January 21st. By all accounts, it was a joyous homecoming, with family and friends coming from all over to visit Boun Lod and Noi, and to see how Boun Lod was doing. I suspect that most of the visitors were surprised to see the changes in Boun Lod, and to see how much she’d grown while she was away. Shortly after Boun Lod returned home she started school. 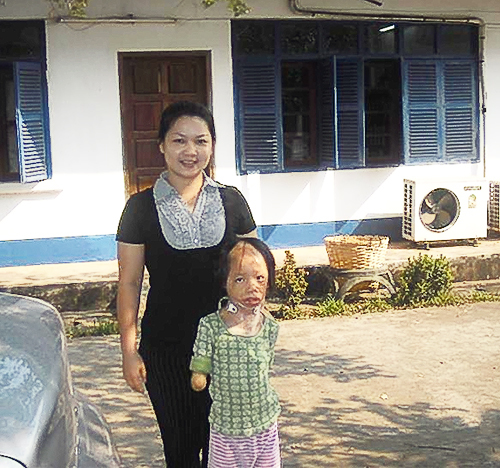 Due to her disabilities, Boun Lod would not be allowed to go to a public school but our contact in Laos, Andy, found a private school that agreed to take her. Initially, the school was apprehensive about the reaction of the other students, but even more so about the reaction of the student’s parents. Judging by the photos of Boun Lod with her classmates, the kids are no problem, and we haven’t heard of any complaints or misgivings from the parents. Because Boun Lod was late starting school she’s a little behind, and the school’s principal suggested that Boun Lod do some extra work with a tutor to help her catch up. We have used some of the money that remains in the Boun Lod Fund to pay for Boun Lod’s tuition, and we’ll use money from the fund to pay for any extra tutoring costs. Boun Lod with her mother Noi at school. While a definite date hasn’t been set yet, Boun Lod is tentatively scheduled to return to Cincinnati in June 2011 to continue with another 12-18 months of surgery and treatment. Up until now, Boun Lod’s surgery has focused mainly on restoring function and mobility, and on making sure that she can grow properly. The next round of surgery will start to be more cosmetic in nature. This entry was posted on April 29, 2010 at 3:51 pm and is filed under Uncategorized. You can follow any responses to this entry through the RSS 2.0 feed. You can leave a response, or trackback from your own site.